Ever thought I’ve only got fifteen minutes, not enough time to do anything with that, well this page will hopefully show one or two of my fast jobs that make a difference. They’re not much, but all become a part of the whole project and eat away at those ‘one day’ job lists. 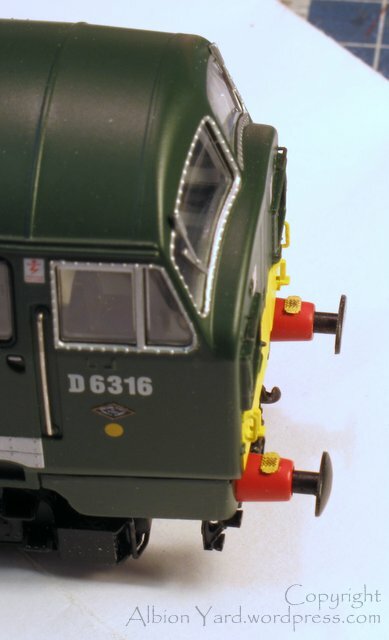 Here’s a cheeky little one for you Class 22 owners whilst you relax after searching for all those removable valances that drop off the chuffing thing. Definitely not ‘design clever’ that idea.. Anyway, having reassured my mate Al that ‘it always does that’ one of my team noted the face looked different on my 22 to others they’d seen. There’s room for improvement on it, and the easiest way to improve the face of the loco is to get rid of the tortoise shell buffers. It’s not even a fifteen minute hero this one, more like ten. Take a file, and file the buffer face flat! Wow! real modelling in ten minutes. The add little bits from that nice man at Shawplan .shawplan.com/ and you’ve got a real difference! I’ll add a bit more on the main blog in due course. 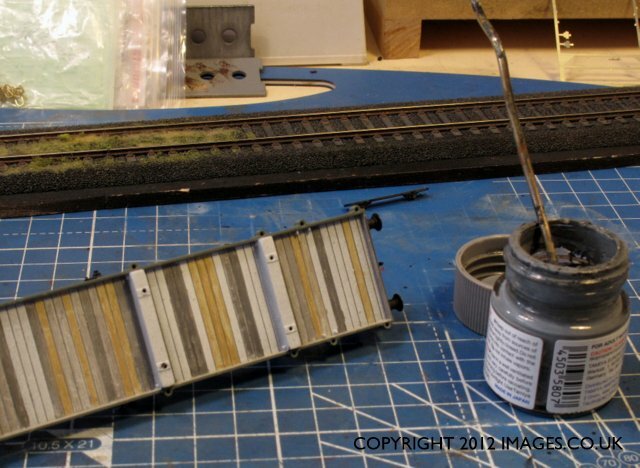 In another ’15 minute hero’ heres how to get a better looking planked finish to a wooden floored wagon such as bogie bolsters or flat wagons. 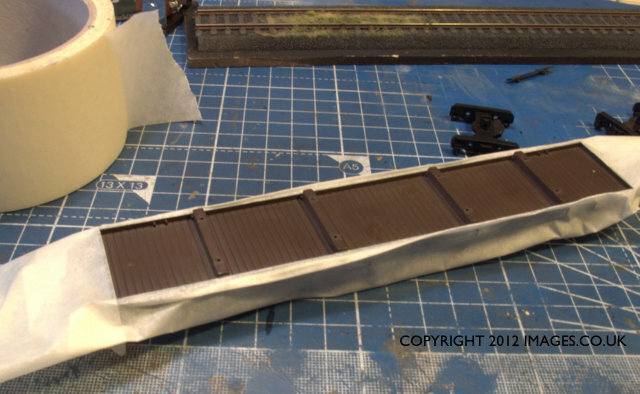 As you can see from the image below (Mainline Bogie Bolster), the ready to run wagons often come with a dark brown finish for plain wood. It’s like primary school art, trees are (Michael Caines acting is) wooden, so therefore, wood = brown. Normally however, trees are shades of grey, some say, up to fifty, and also grey/brown mixes. Unfortunately this really shows up when you start to add color and weathering to your other models. It is also the wrong color for fresh wood, unless you’re considering a dark wood like mahogany. However, mahogany would be far too expensive to use for a vehicle that had the harsh life of freight stock, so it’s a good idea to change the color. The next few illustrations show how I do it quickly and easily. 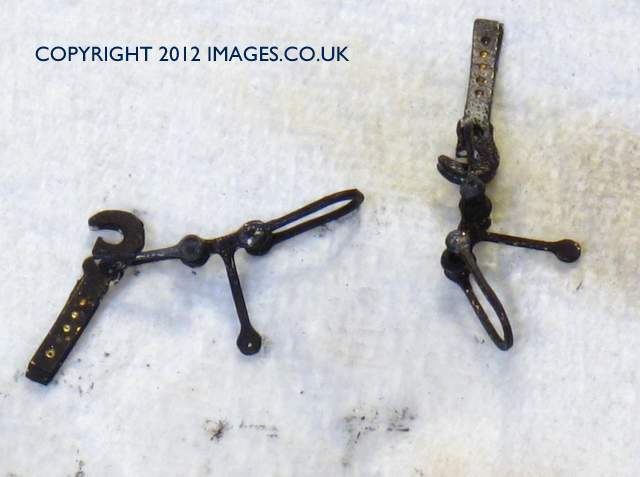 First thing is to remove the bogies and or any detail that can be easily damaged, like pipework or stantions. I’m using normal household masking tape here, if the shapes were more complex I’d use Tamiya masking tape for the edges and then back fill with paper or the masking tape above. Ensure that any area of the wagon you don’t want painted is covered. Using these car paint cans is a bit crude, the spray is wide enough to cover the whole model and then some! I’ve left enough tape at the ends to actually use as a handle to hold the wagon whilst spraying. Doing this speeds the job up and ensures complete coverage. This is the stuff, use white rather than grey as it will make varying the planking shades easier later on. Also make sure its the Plastic primer. 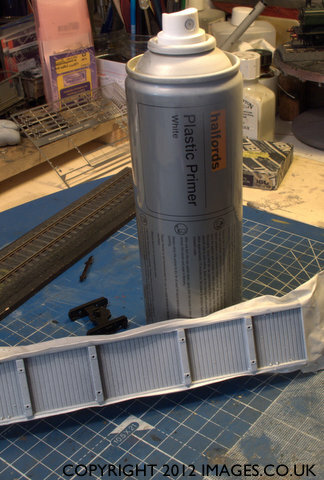 There are still some agressive paints that are available that may damage the model, this Halfords stuff, has not damaged anything I’ve used it on. I use a variety of paint types, here I’m using Tamiya acrylics, but other planks were painted with Vallejo, and also Humbrol enamels, basically I use whats to hand and use black to add a tonal variation. I paint the planks individually even if using the same color. For the lightest color planks I use a strong wash over the white undercoat. 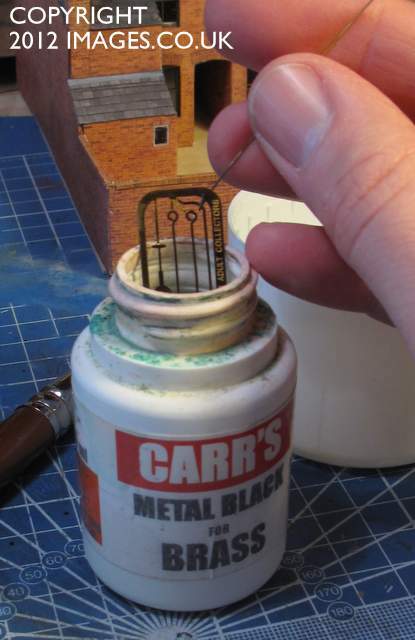 To accentuate the joins I’m using a MIG pigment wash, the density of the wash can be easily varied. The pigment is easily described as paint without the liquid, and I’ll put up a posting in the future on how I use them, they are a very valuable medium to use in the paint shop. This post https://albionyard.wordpress.com/2011/11/27/rust-dirt/ details the colors and mediums that are my primary work palet. There may be some thinking this is never fifteen minutes work. Well its not far off, probably a bit longer as I was snapping as I went. The initial mask and spray takes about five minutes, particularly if you accelerate the drying time. Then its up to you how much time you put in the next stage of varying shades and painting. Even if you only do a single shade of grey, the improvement is far better than the original deep brown fresh from the box. This is the completed wagon, its been toned down with a dusting of light greys and browns from artists pastels and then ‘fixed’ using Vallejo acrylic matt varnish. All I need to do now is add some knackered stantions and chains and shackles waiting their next load. 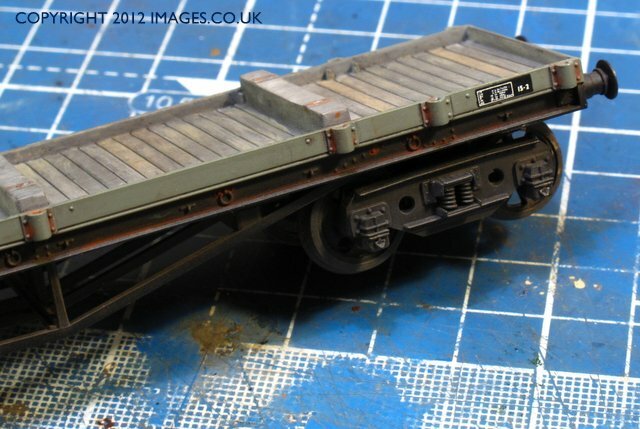 Heres another quick job that’ll add some character and life to a GWR or BR/WR locomotive. 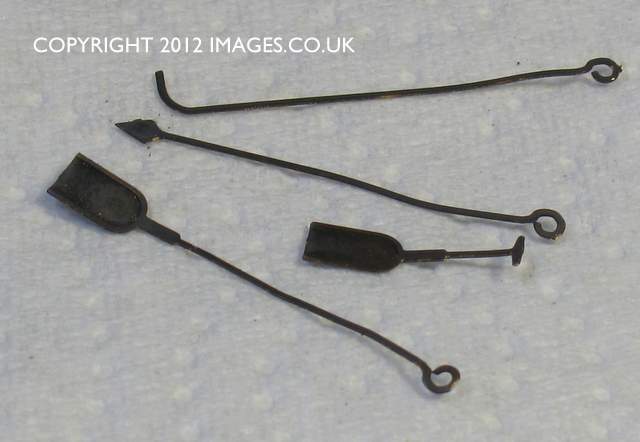 Many prototype images show a set of Fire Iron tools in the tender, on the rear tool brackets as per the Pannier illustrated, or lying along the top of water tanks on locomotives like the 45/55XX or 41/51/61xx Praries. 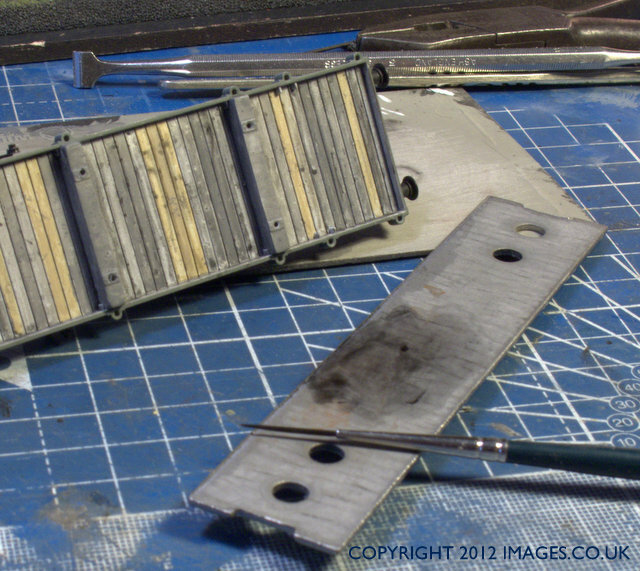 This is the raw etch, tools are well defined and they are well positioned in the fret to cut out. Using a very fine wet and dry paper I gently rub both sides of the etch in preparation for the next bit which will save some offort when painting. The etch is dipped into a blackening solution for a few seconds, I probably leave it in for ten or so and having rubbed them with wet and dry previously, there is plenty for the ‘black’ to get hold of. You can actually see it change color as the process occurs. The blackening process can be stopped by immersing the etch in water. WHen its dry the etch will be a black colour and there is a matt residue left on the surface. This will come off with a wipe of tissue. 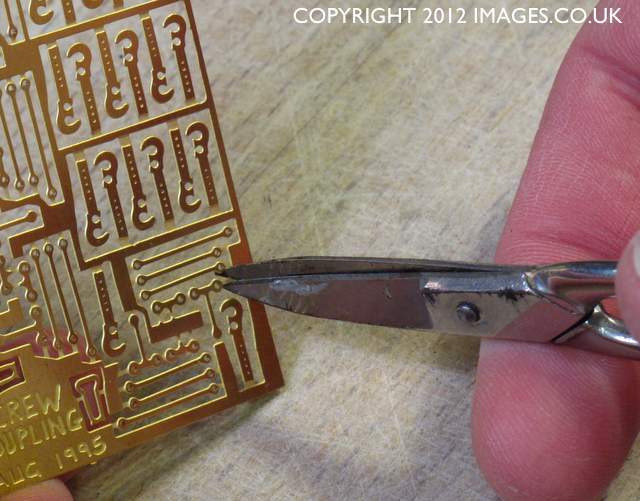 The tools can then be cut from the etch, I use a pair of sharpened nail scissors for this job. In real life the tools got pretty knocked about and didn’t stay nice and straight for long, so all of mine show a bit of lifes journey in their shape. 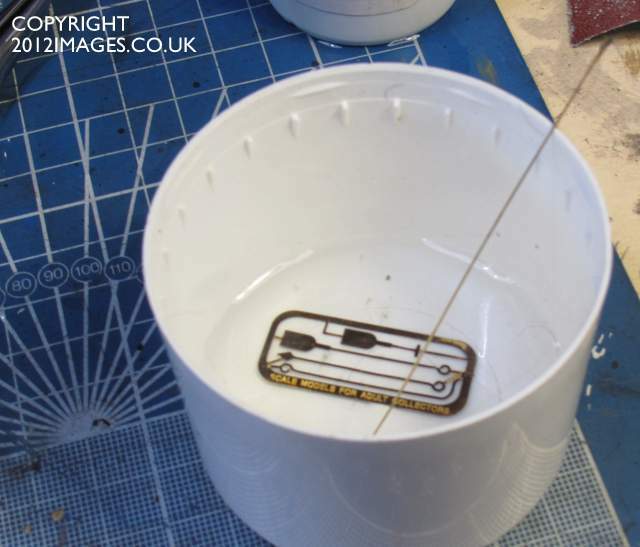 You don’t need to put all the tools on, its often that you’ll find a picture with just one or two of items on board an engine, there are plenty of reference pictures in books which show variations you can model. 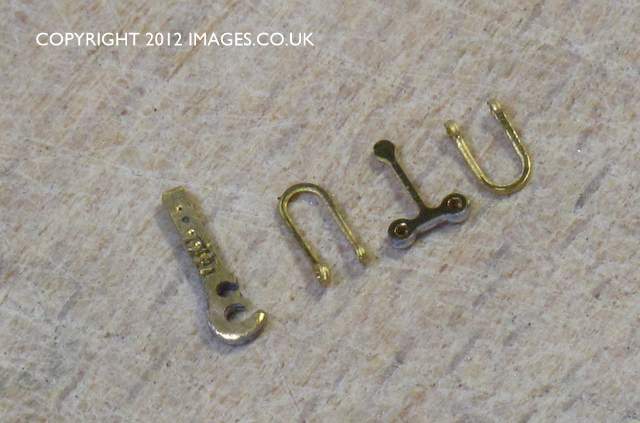 You can use the same technique when replacing lamp irons too, and 247 as well as others do different types which you can fit. The first quick job that comes to mind is couplings for rolling stock. I use three link couplings on both EM and OO stock, as I can live with ‘the hand of god’ appearing on scene for a few seconds or so. Screw couplings for me in the past been difficult to find really good reliable and reasonably sized couplings. I do use overscale couplings due to practicality. 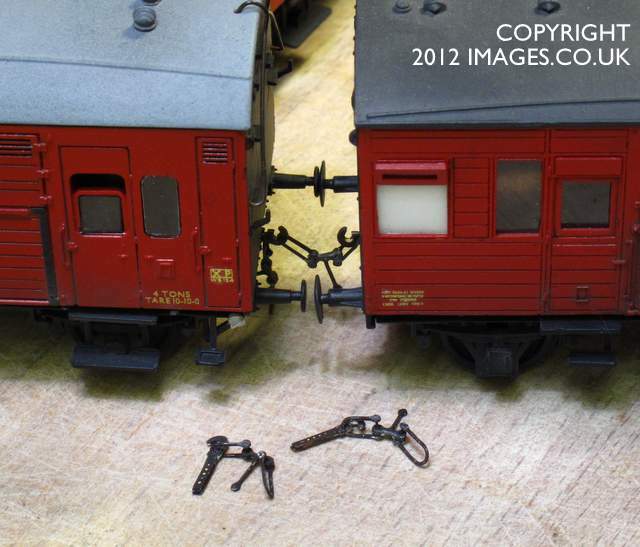 The best off the shelf couplings were Cambrian, unfortunately no longer available. Then theres the Romford coupling, I have a few of them and they are gradually being replaced as I do any work on an item with them. They are very overscale and often stiff where the wire is wound on the links shaft. This means they hang unprototypically, an actual link is a pretty chunky and weighty item and gravity takes its own course, downwards. The other often used types are etched links. Smiths do a set available built or as a kit. I’ve found these not particularly easy to assemble, and they aren’t particularly robust, and I got fed up with them. If you use heavy trains then again the links can fail due to the small etched link shaft bending and the coupling coming apart. I’ve now standardised on the Masokits screw coupling. These are the best value and once assembled the most robust, and they come with a nicely illustrated instruction sheet. 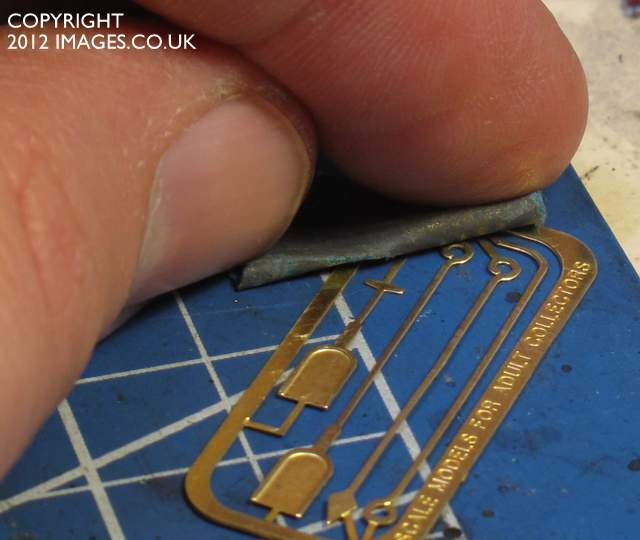 It does take some soldering, but if you can solder a wire to a DCC chip, these will be well within your ability. So do they pass the fifteen minute test? 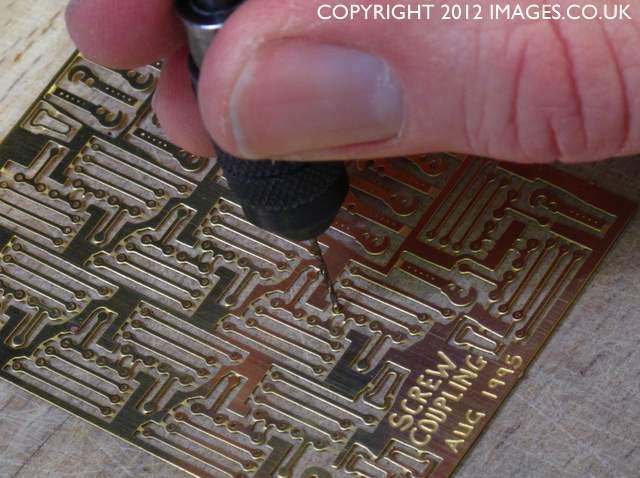 The first thing is to drill the holes in the etch 0.5mm to remove any etch cusp. Then use a very fine wet and dry paper on both sides to clean the etch. Choose if you’re using long or short links. For praticality I use short link at hook and long link to couple. 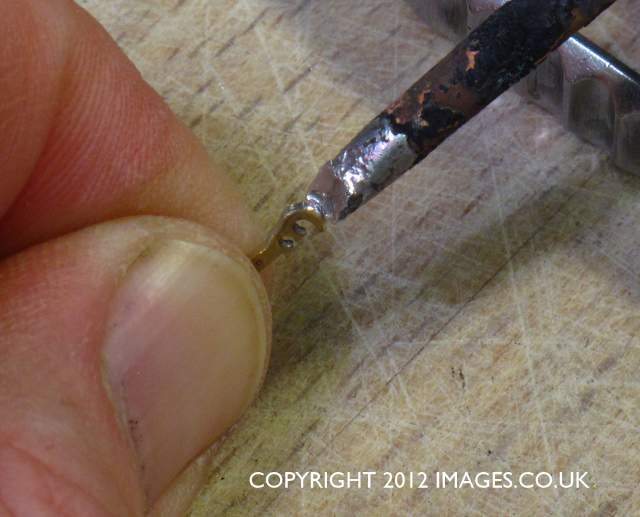 Cut the link from the etch sheet and form around a drill shaft ensuring the link eyelets are parrallel to each other. 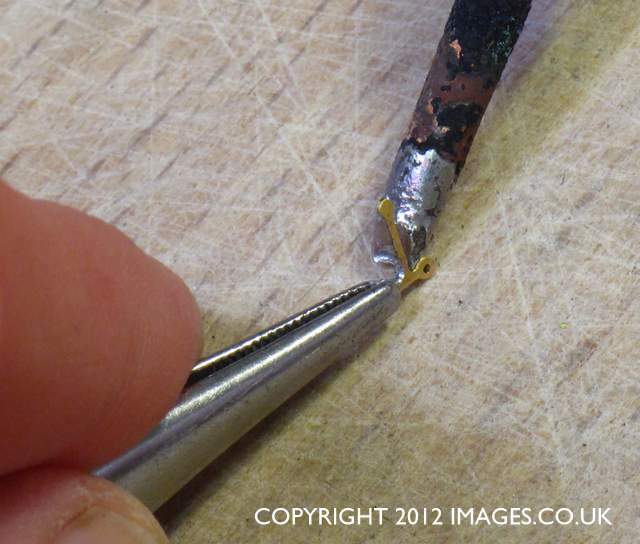 Fold the centre link etch with the tommy bar and solder it together. 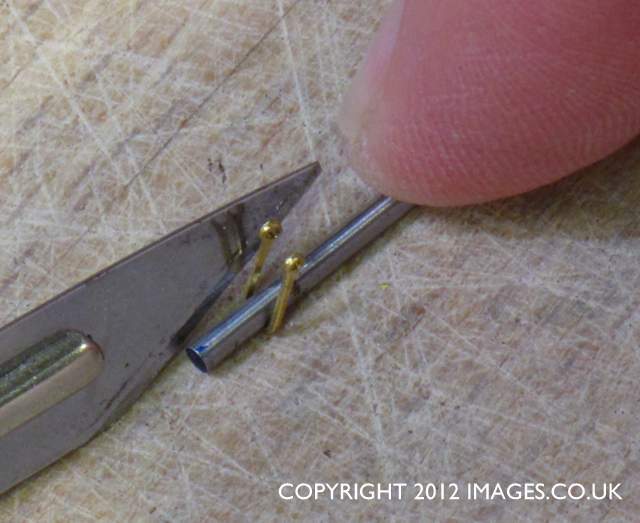 Get a clean overlength section of 0.5mm brass wire and thread it through one link, the instructions suggest a brass lace pin, but if you can’t get them, do as I do and use wire. 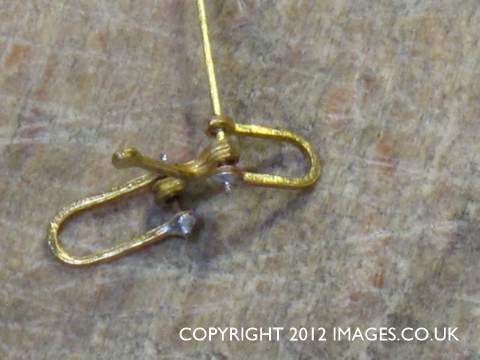 A quick touch of the soldering iron on the outside of the eyelet will make the join between the wire and link. Cut the excess wire off and file flat to link eyelet. Note I’m not tinning any of the components as that will potentially seize solid. Repeat on the opposite side. Then repeat the procedure again for the other link. 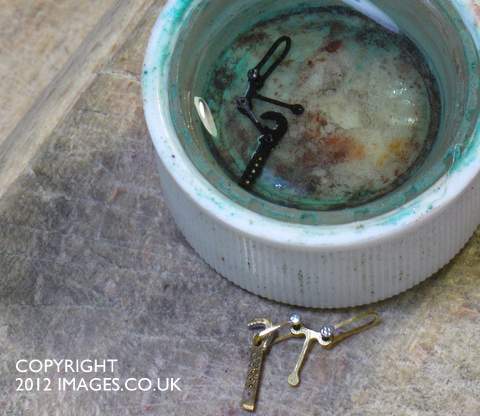 Remove the hooks and form them soldering them together. 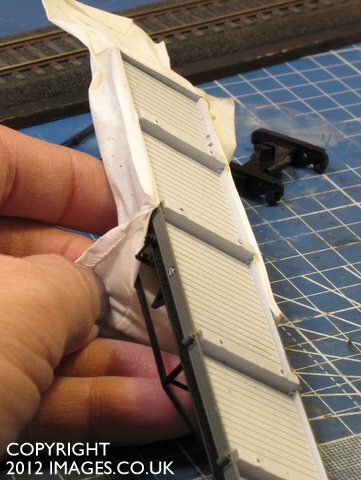 Clean any cusp material off and then attach the links. 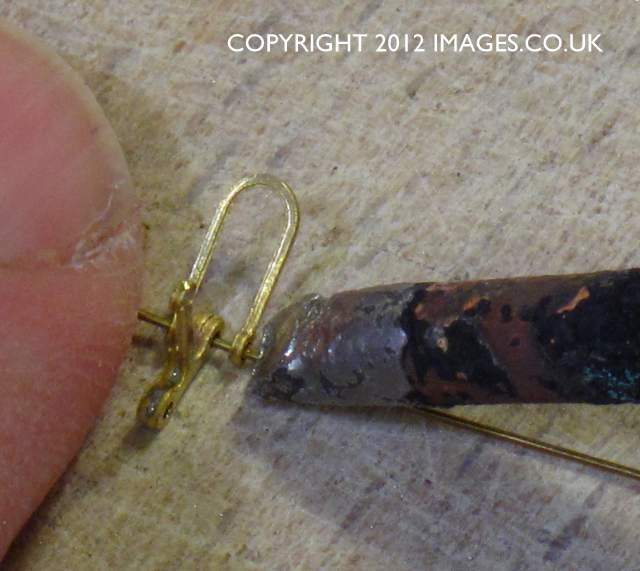 To do this twist the hook enough to allow the link loop to fall into the link slot, and twist back closing the slot. That’s it coupling completed, you may not manage fifteen minutes for your first one, but you soon will, I tend to batch build them though, completeing them with a dunk into a chemical blackening solution. These couplings are good looking, functional, robust and by far the easiest I’ve ever built. 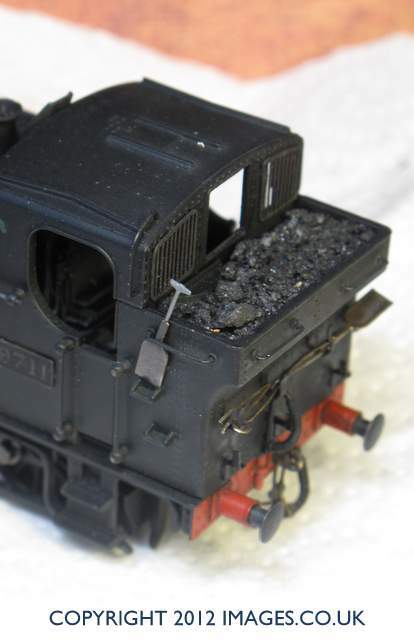 Just because they are soldered construction that shouldn’t put you off, and it does result in a coupling that so far in my experience is unbreakable with normal use. You made that look pretty damn easy Paul, I’ll be having a go at these I think! Thank you for sharing your methods- the wood weathering is excllent and will be used. What a great page! The myth that you need rafts of spare time to enjoy our hobby is officially busted. Thank you, I don’t know about ‘officially’ though! Fantastic ideas, I’m always looking to tweak things, so some food for thought there. Are you American, as I do believe there is a U in colour when when written in ‘proper English’. But then I realised exactly that! Rather than waiting until I had a free afternoon to complete a project (which doesn’t happen often) I could break it down into segments, in this case mask, prime, paint then weather. Excellent info and nicely presented.